Once primarily a threat to senior citizens, the latest wave of scams has been targeting ordinary taxpayers, tax preparers, and unsuspecting students and parents across the country. “These scams continue to change in form, but the purpose is always to frighten or scare the citizen into giving personal information or in some cases to pay a fine or tax to avoid arrest or prosecution,” said Chester County Sheriff Carolyn “Bunny” Welsh. To boost their nonexistent credentials, scammers will often impersonate an IRS agent with false badge numbers or identify the last four numbers of a potential victim’s Social Security number. A scammer will typically ask victims to validate tax-return information to collect personal information. Some con artists will insist that a deputy sheriff or police officer will take the victims to prison if they don’t satisfy back taxes. In some versions of the scam, the crooks call potential victims and inform them that their Social Security numbers have already been used for tax-filing, causing their claims to be rejected. To “fix” the problem, the scammer seeks proof of identity from the victims. Such information enables the scammer to steal identities and file fraudulent returns, using an address the scammer can access to collect the refunds. Once the scammers lure money from a victim, they will often strike again, telling the citizen that they represent the FBI, which is investigating the scammers that recently took the victim’s money. The victim is then encouraged to pay money to the investigators to recoup the initial loss. New variations of phishing schemes – attempts to get information such as passwords and credit card numbers through emails disguised to resemble official communication – are impacting tax professionals. The scammer poses as a potential client and sends the tax-preparer an email asking for tax assistance. When the tax-preparer replies, the scammer sends another email with an embedded web address or attachments containing embedded web addresses. When the tax-preparer downloads the information, the scammers can collect email addresses, passwords, and other proprietary information. Scammers identifying themselves as IRS agents and demanding full or partial payment for the Federal Student Tax, which does not exist, are swindling students and parents. Sometimes the con artist will alter the caller ID – a process known as “spoofing” – so that a call appears to be coming from an official source. The scammer will ask the student or parent to wire money immediately using a gift card or money transfer company, threatening to report them to local authorities if they don’t comply. The IRS is warning taxpayers to avoid any offer that sounds too good to be true, such as promises of refunds for low-income residents with no documentation or claims for the expired Economic Recovery Credit Program or for economic stimulus payments. 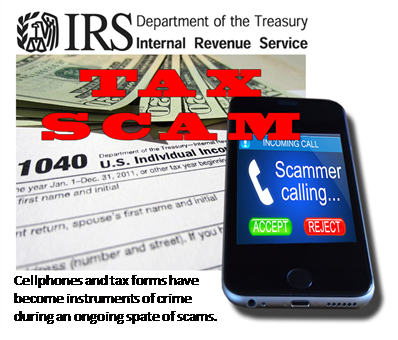 IRS representatives will never call and demand payment over the phone, threaten taxpayers with arrest by local authorities if payments aren’t made, demand a specific method of payment, or request credit-card or debit numbers over the phone. Phishing and online scams should also be reported to the IRS at https://www.irs.gov/uac/report-phishing. For information on identity protection and victim assistance, visit https://www.irs.gov/individuals/identity-protection. Additional information on scams and phishing can be found at https://www.consumer.ftc.gov/articles/0003-phishing.